It's been a month since the TCL H(app)iness Launch Party and we're all still raving about it here at the TCL office! We've had the opportunity to work with many sponsors to pull the event together for all you ladies, and you can catch up with what went on at our video here or read our event coverage blog post here. One of the sponsors that we were most honoured to work with during the event was none other than Styled Story who were the ones who had styled up the entire space of Funan Showsuite to look as it did during the party! If not for the Styled Story team, we wouldn't have had such a beautiful and aesthetic set-up that we could use and feature! Below are a few snapshots of Styled Story's creation during our event! 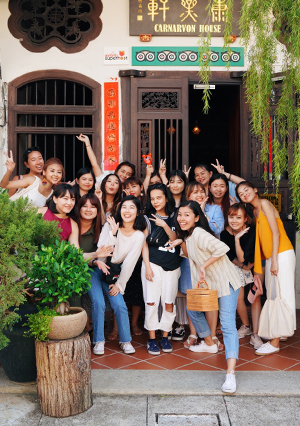 In today's blog, we chat with Li Yi, founder and girl boss of Styled Story, to get to know a little bit more about her and to also hear her story! TCL: Hi Li Yi! Thank you for giving us this opportunity to interview you. We loved working with you for our TCL Mobile App Launch Party and would love to hear more from you and your company. So first things first, how did Styled Story come about? What made you start Styled Story? Li Yi: Hello! Thanks for having us on board as well! We've always wanted to create a giant organic balloon structure and thanks to the artistic freedom you guys gave us, we were able to do so at the Launch Party! That was so much fun! Hmm, Styled Story wasn’t always Styled Story, and there was a time that we didn’t even offer styling services. I was actually living in France for a couple months and found myself gravitating towards the vintage paraphernalia at local flea markets, returning home each time with a new found gem. My hobby eventually kickstarted the prop rental aspect of this business and eventually, we got to where we are today. Hooray! TCL: What type of events do you do at Styled Story? LY: Apart from wedding styling, we also specialise in celebratory events like birthday parties, corporate events... anything really! As long as the space needs some sprucing up, or if you have a bunch of big ideas and aren’t too sure how to put it all together, or even setting up for a simple dessert table, we’re happy to come on board! Bonus points for a charming love story or a fun theme for us to work with! TCL: We're interested to know what do you do as an event stylist? The job sounds really fun and interesting! LY: Sure, it gets pretty interesting behind the scenes! Being an event stylist is essentially being a bit of everything – we’re the handyman, the artist, the florist, the shopaholic, and the cleaner all in one. The conceptualisation process (that's no doubt challenging) is fun because you really learn to find inspiration from everywhere. Next comes the excessive shopping: for materials, props, the most specific items in the exact shade of colour that we want in our heads. And of course, finally, the big day arrives and we’re there and gone before anyone has noticed (or at least we aim to achieve this feat)! But really, standing back and admiring our team’s creation when it’s all done offers an unrivalled sense of pride and accomplishment! TCL: We're sure you've planned and styled many events over the years, but do you have one single most memorable event you've styled so far? Are there any interesting moments that you've experienced while styling a particular event or events in general? To be honest, it’s hard to single out moments because there are quite a lot of interesting or special moments throughout my journey with Styled Story. Each wedding, or even kids’ party, has had its mini ‘WOW!’ moment for me, so I hold them all dear to my heart. TCL: Thanks so much for sharing, Li Yi! So now, moving a little more into fashion... We're interested to know how you would describe your fashion style? LY: If I had to sum it up in one word, it would be ‘relaxed’. I’m guilty of choosing comfortable, loosely casual numbers (that still hug in the right places), over dressing up on any given day. I’m more of a shorts kind of girl and you will know it if you take a peek into my closet. There’s one accessory that I never leave the house without though – and that’s my handcrafted wooden watch with an old-school leather strap. TCL: Styling events must require quite a bit of physical work. Do you have any type of clothes you wear for your styling days and appointments? LY: For styling days, as you’d have personally witnessed first-hand while behind the scenes of the TCL mobile app launch party, there’s always a lot of running around, climbing up, and heavy lifting. 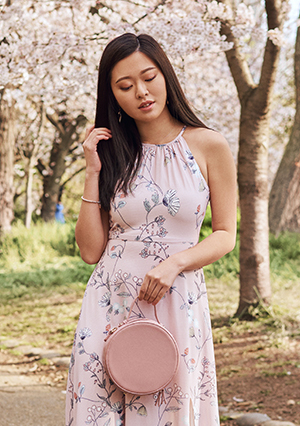 Our go-to outfits for all of us here at Styled Story will definitely have to be comfortable and casual pieces that do not restrict movement - and preferably apparels with large pockets. Pockets are actually very important! Shorts or culottes are the better option compared to skirts or dresses. Our current favourite is overalls with big pockets for us to tuck away our tools (i.e. scissors, fishing wire, etc.). And of course, appointment days with our clients call for a slightly more professional look for that added confident boost! TCL: What's one TCL apparel you can wear for a styling day? Share with us why you picked it out and why you like it! LY: I absolutely adore the Rowana Tweed Shorts! As much as I love patterns or textures, I feel that it’s not usually easy to match prints with other pieces. The Rowana Tweed Shorts is different though since the tweed material and colour of the shorts gives a little unique design to the piece but is versatile and super pretty. It goes well with the majority of my closet haha! Plus, it doesn’t hurt that it comes in a set with the Rowana Tweed Peplum Top for those days I’m unsure of what to wear (which is very often, I must say) – this is certainly going to save me a lot of hassle! Definitely feels good to look good while doing our best at set-ups. Oh, and not forgetting how comfortable it was to wear it for the entire day! Thanks so much, Li Yi and team, for working with us and gracing us with such aesthetic creations! Indeed, event styling does sound like it's a lot of fun (and we are sure it is, given Li Yi's insights) but it also calls for an eye for details and aesthetic flair. Watching how the entire Styled Story team brought their vision to life at our event made us respect them from the bottom of our hearts. If you're looking for an event stylist for any of your events, Li Yi and her team at Styled Story are the ones to go to! Whether it is for your big day, or for corporate or small private events, you can count on them to make magic with the space! For more updates on Styled Story, you may follow them over at their socials @styledstory on Instagram on Facebook. Or you can visit them over at their website at www.styledstory.com for more information about their services!